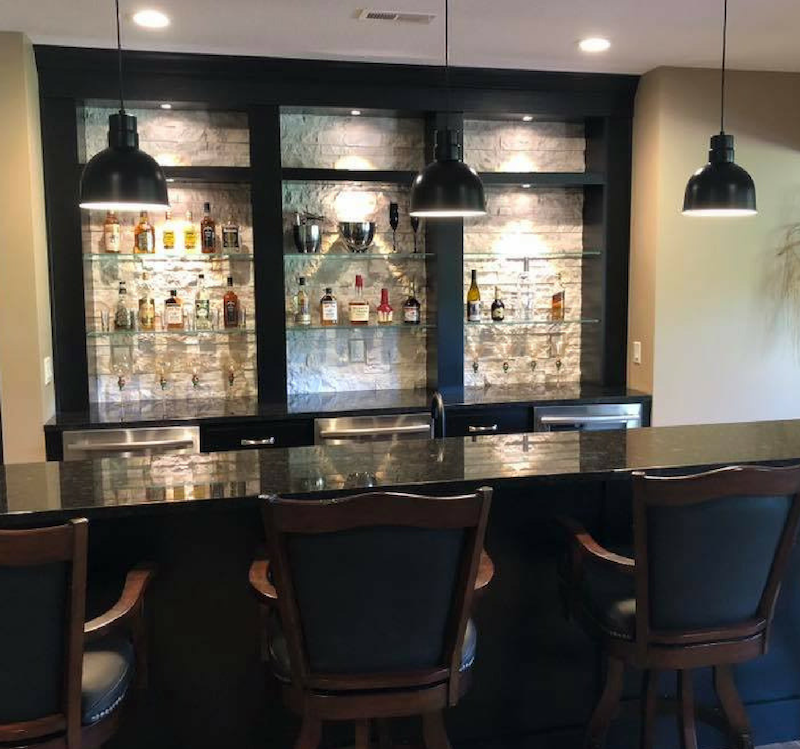 This Spring we have the great pleasure to have our designs and products included in a number of homes in the Quad Cities Builders & Remodelers Association Spring Parade of Homes. 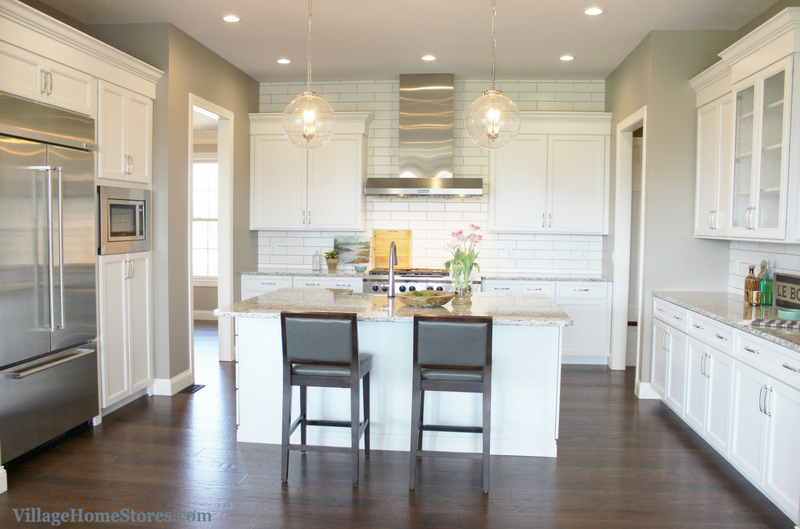 We share a lot of remodel stories here on the blog but we also put our designs and product into new construction homes. We wanted to share some tours of these homes to give you a look at what “New Construction” looks like in the Quad Cities region. This home built by Heartland Builders is in Bettendorf, Iowa. 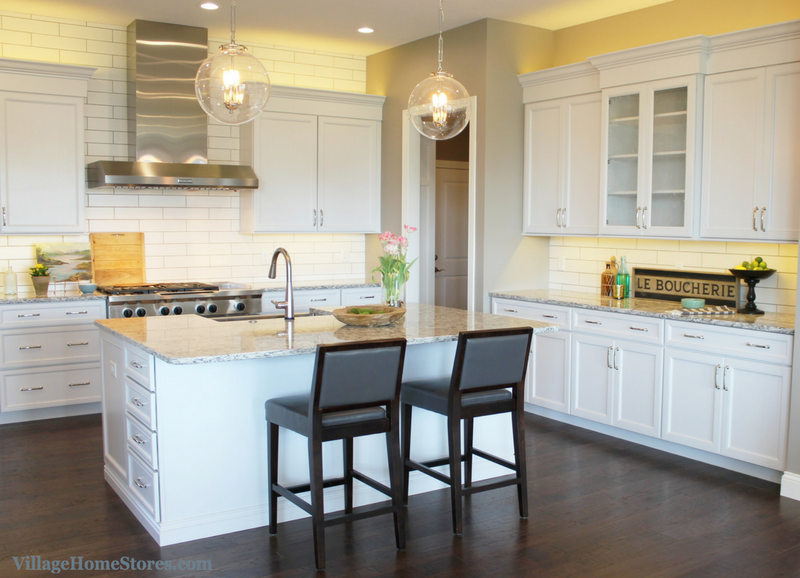 Heartland worked with us and purchased all cabinetry, counters, appliances, and lighting for this home from our store. 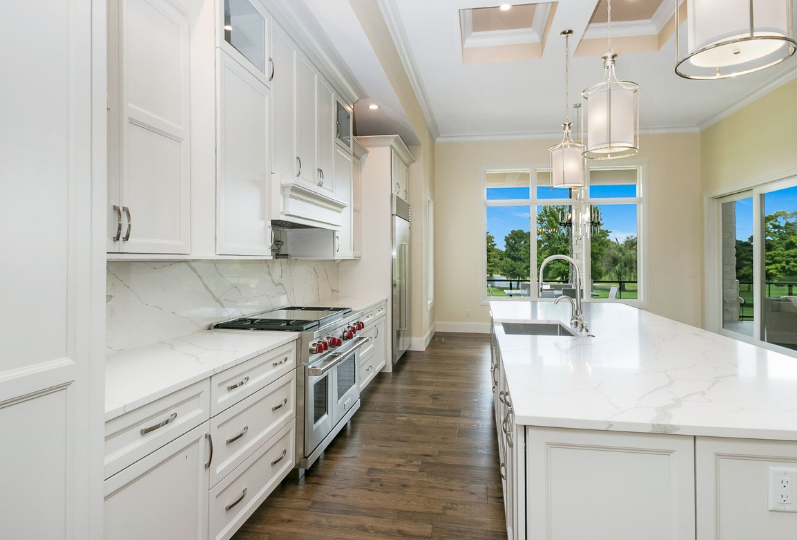 Let’s begin a tour with the stunning kitchen. A clean and classic look! 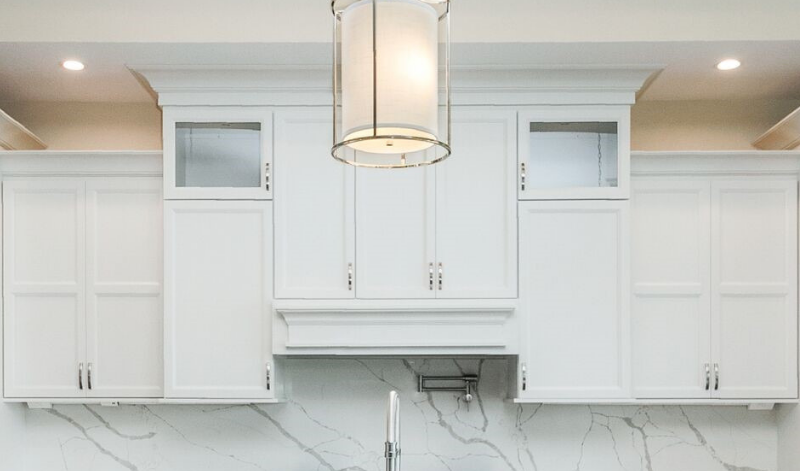 White painted cabinetry from our Koch Classic line in the “Ridgegate” doorstyle is paired with elongated subway tile, quartz countertops, and a KitchenAid® appliance package. 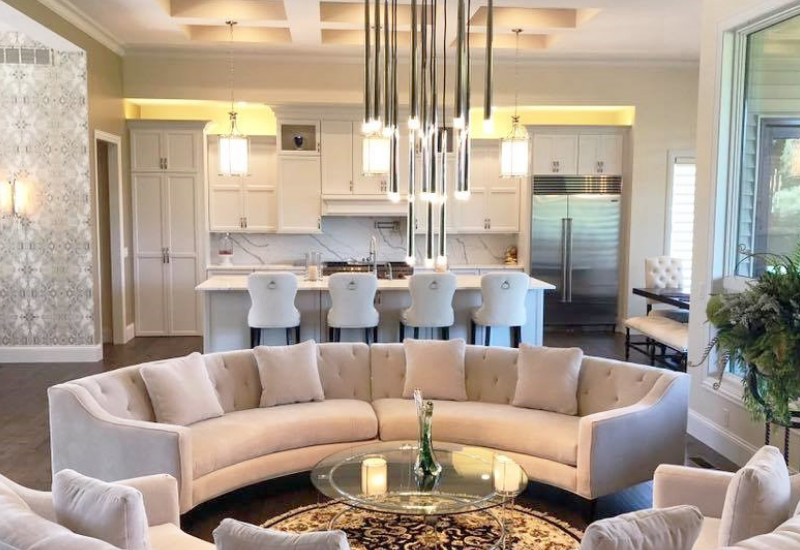 A U-shaped layout with a centered island creates an open and functional space for multiple users and can accommodate many guests within the great room. 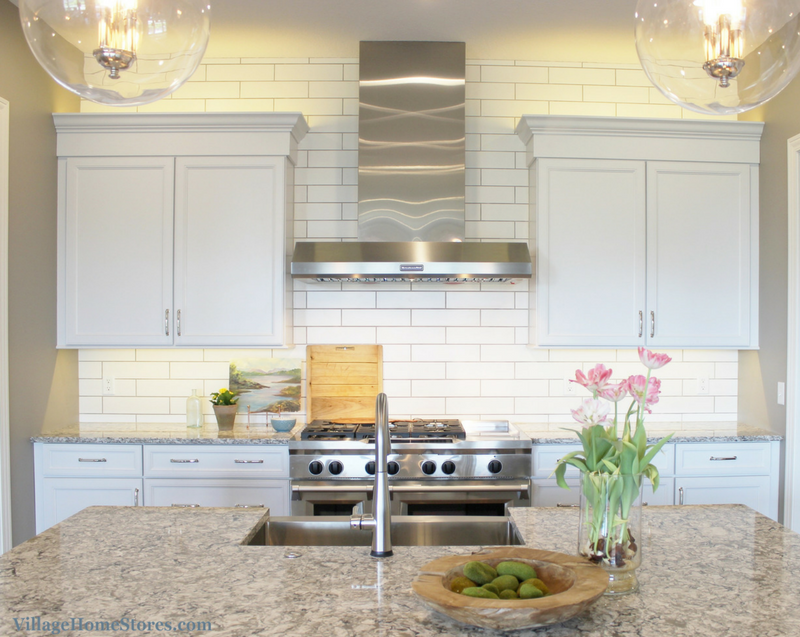 The focal wall in the design is the back wall that is home to a 48″ chimney-style hood and a 48″ wide, dual fuel 6-burner range with griddle by KitchenAid® . This commercial-style range offers features that any home chef can love along with easy-to-use basics. Convection features may sound intimidating to navigate but this model includes EasyConvect™ Conversion to help you adjust times and temperatures. 6-burners on the cooktop plus a chrome griddle that is easy to clean. 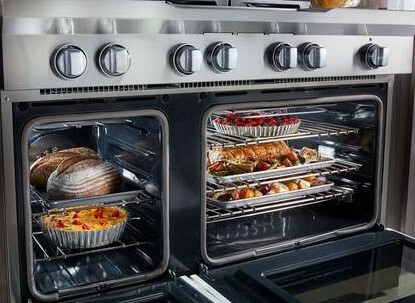 Oven capacity is one of the best parts of including a commercial style range in your design. The combined left and right ovens add up to 6.3 cu. ft. of space! With convection features you can use all of those racks at once if needed and still get consistent results! One “leg” of the U-shape includes a center glass-door cabinet and a long countertop space. This gives a built-in hutch look, and offers a great location to be used as a sideboard to serve food from or set up a beverage station. The other “leg” of the kitchen is where the tall built-in section of appliances are. 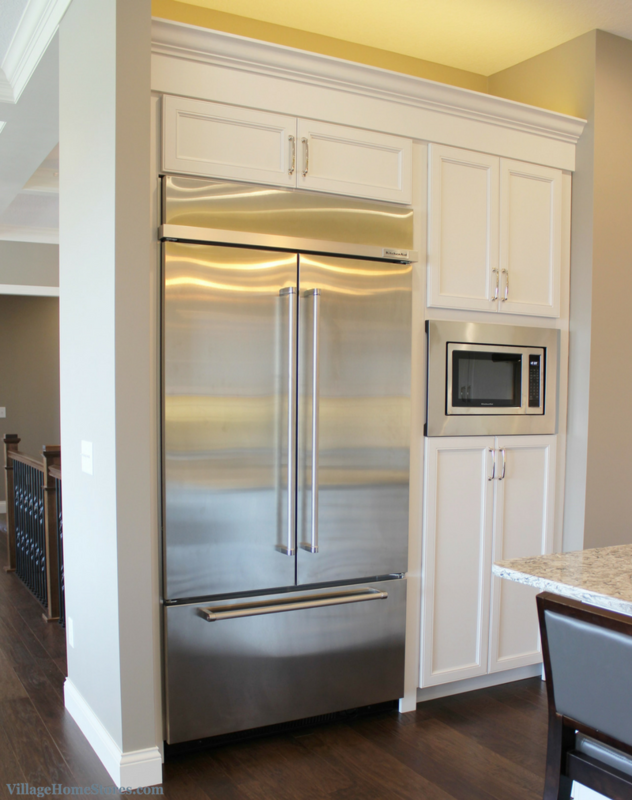 A tall, 24″ deep cabinet offers lots of storage and a center section is fit with a convection microwave oven. A stainless steel trim kit frames in this microwave for a built-in look. 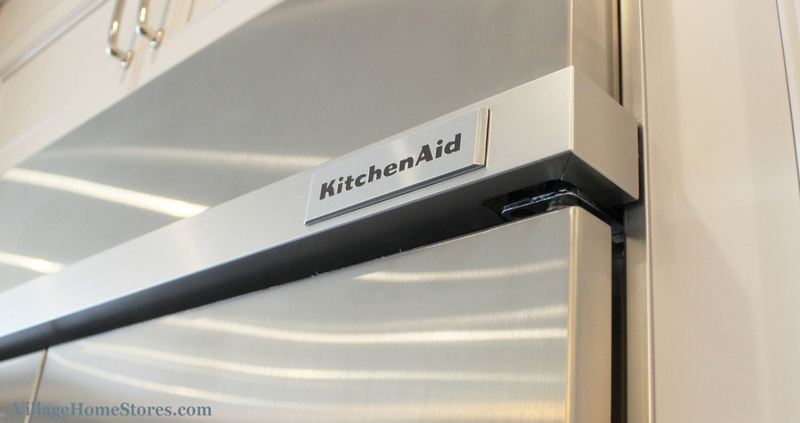 KitchenAid®’s built-in 42″ wide French Door refrigerator. The built-in unit installs back with the cabinetry face frame surrounding it. This offers a much more customized a sleek look compared to a standard-depth model that would project into the space by a handful of added inches. 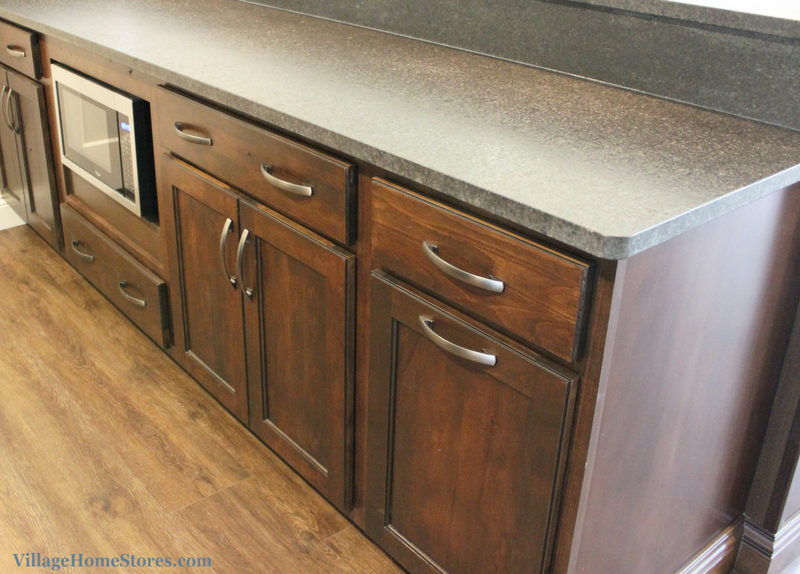 A center kitchen island includes lots of added storage and a pull-out wastebasket cabinets. Having your wastebaskets centrally-located and right on a corner make it so much easy for guests to find them or get direction to them. 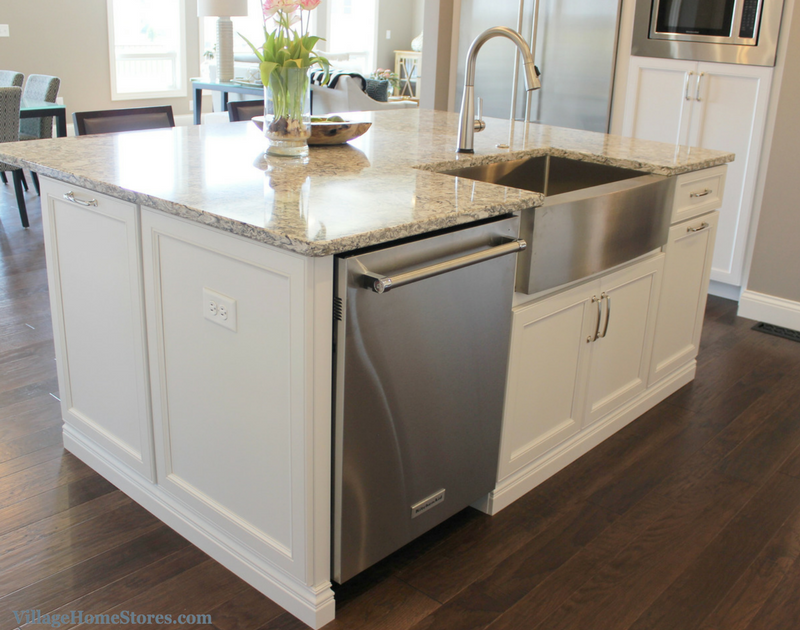 A dishwasher is also found in the island alongside a Stainless Steel farmhouse sink. 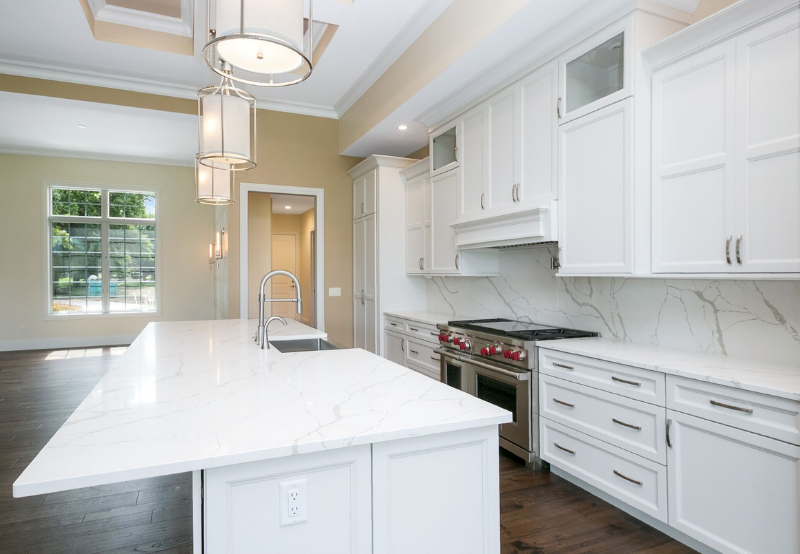 Quartz countertops in Cambria’s “Bellingham” design are a stunning selection. 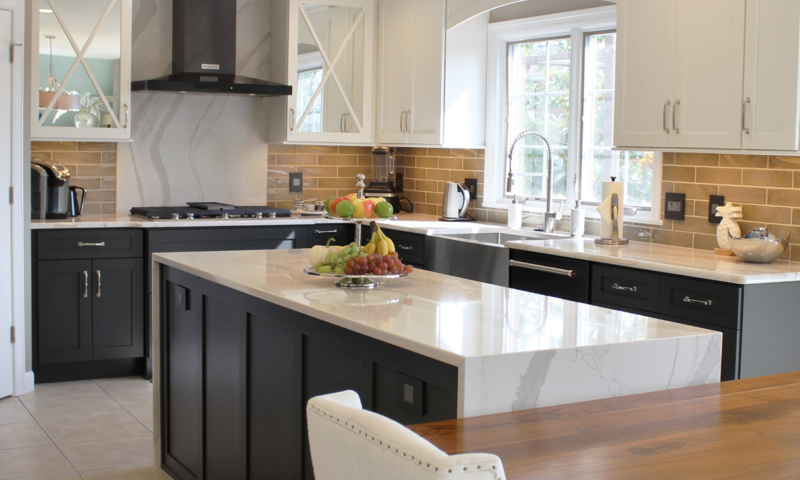 The blend of neutral colors and gray veining add to the classic look of this kitchen. 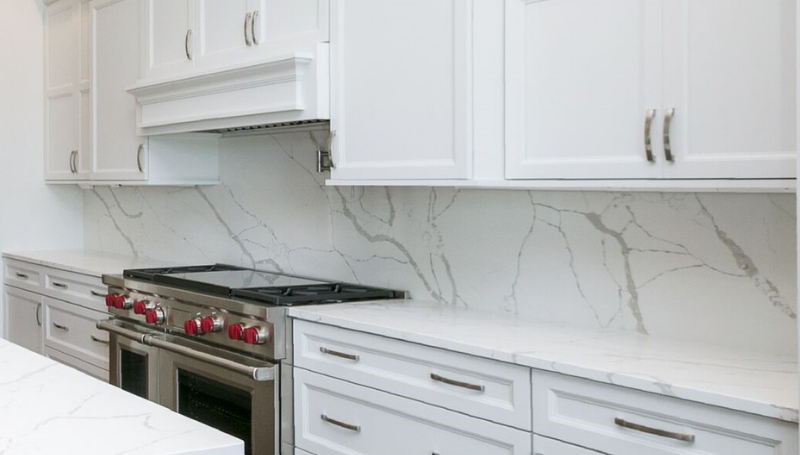 Once installed, Cambria is maintenance free and a wonderful choice for this entire kitchen. A single handle kitchen faucet has been installed and a garbage disposal button is located right above the sink in the countertop. 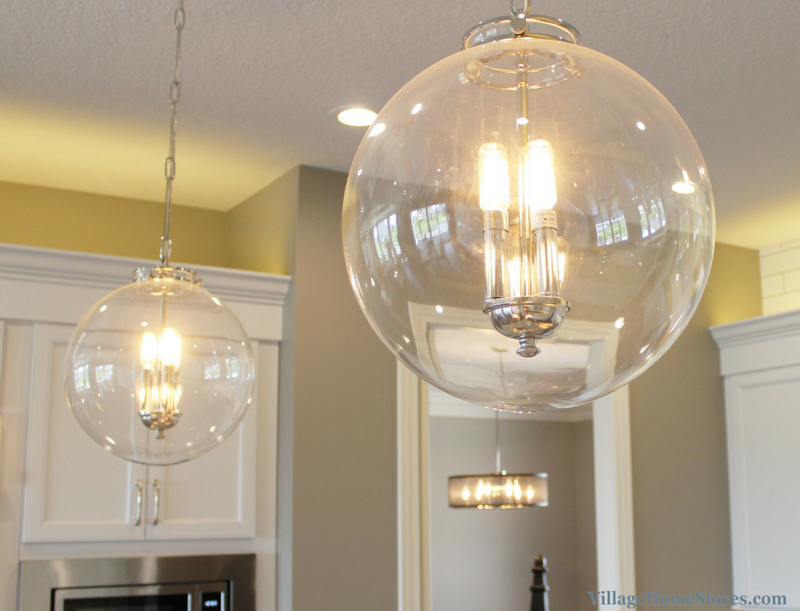 Above this kitchen island hang two pendants by ELK lighting. These clear glass lights help keep the space seem airy and open. 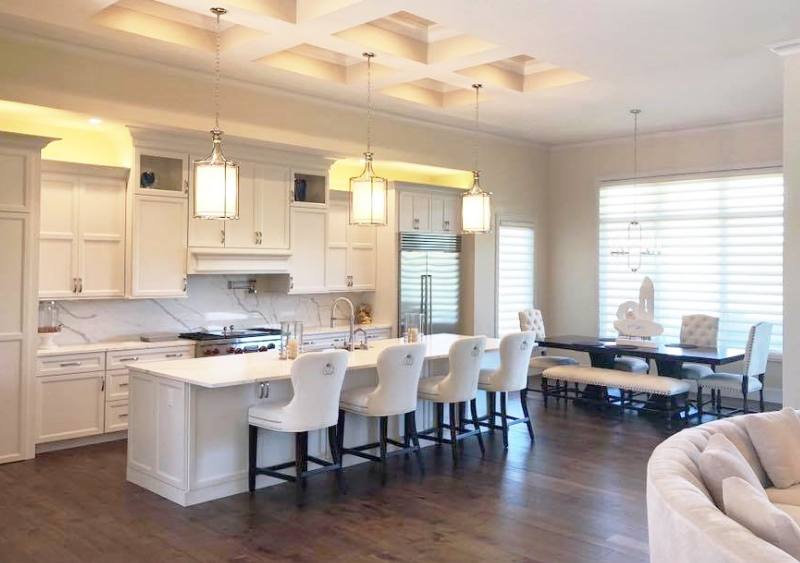 Our lighting experts will work with you and your kitchen designer to select the perfect look, size, and scale of lighting to hang above your kitchen island. There are so many gorgeous lights selected throughout this home. 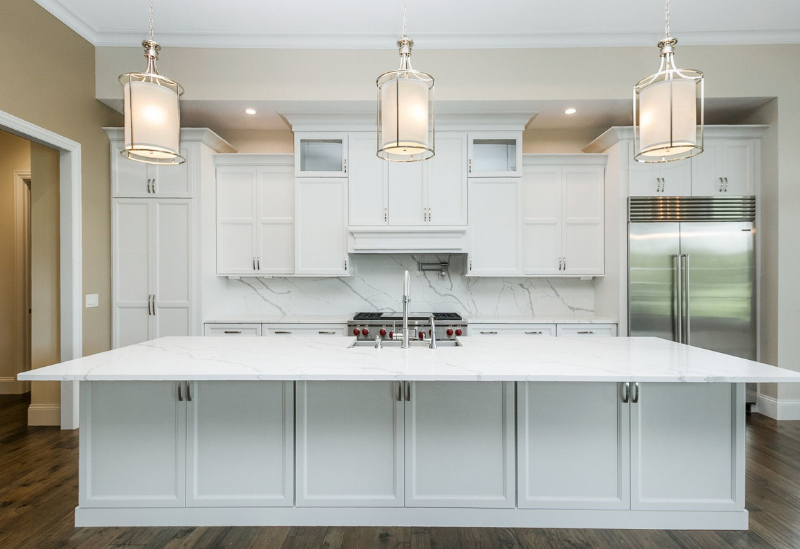 Our new construction lighting expert will sit down with you and your contractor to help determine what lighting is needed and how you can make the most of your lighting budget. 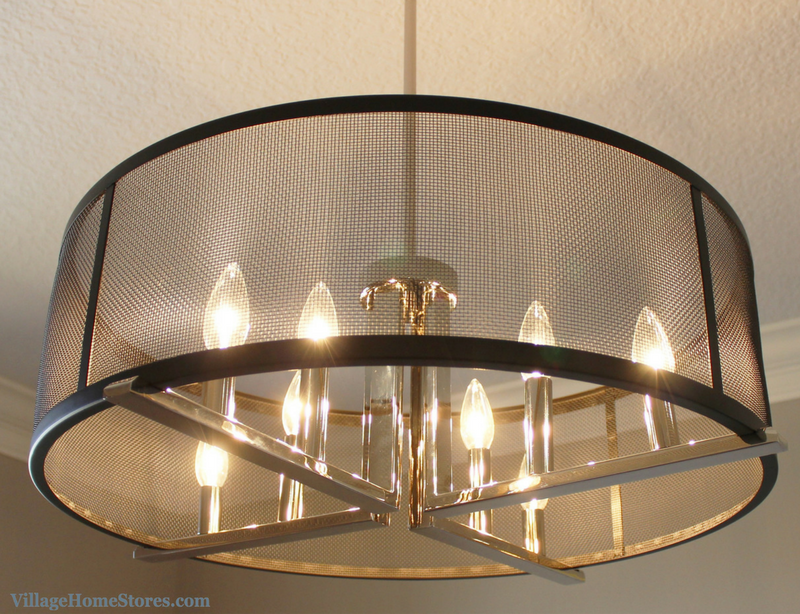 We love the light fixture (show below) that hangs in the formal Dining Room of this home. This 8-light pendant is by Kichler. 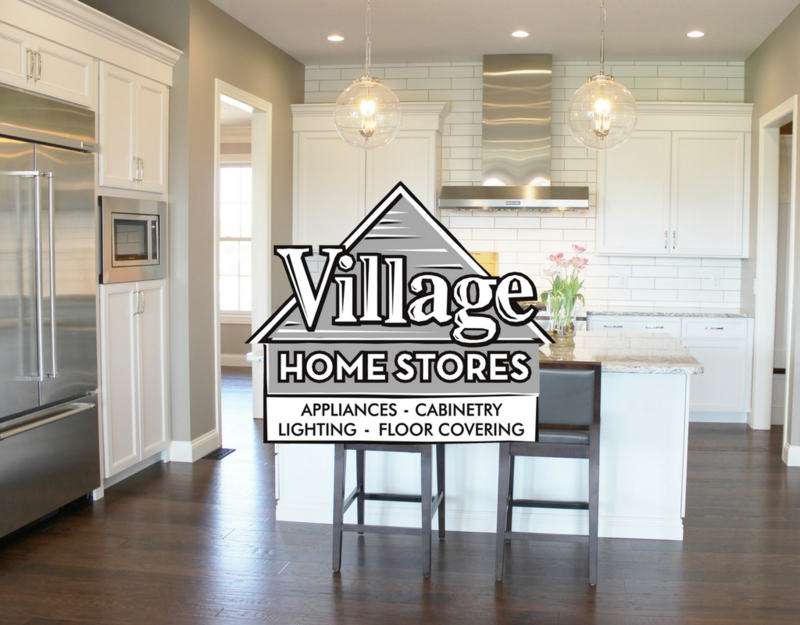 If you are planning on building a new home in the Quad Cities area we encourage you to make a trip out to our store and see how purchasing from a one-stop-shop can help save you time AND money. 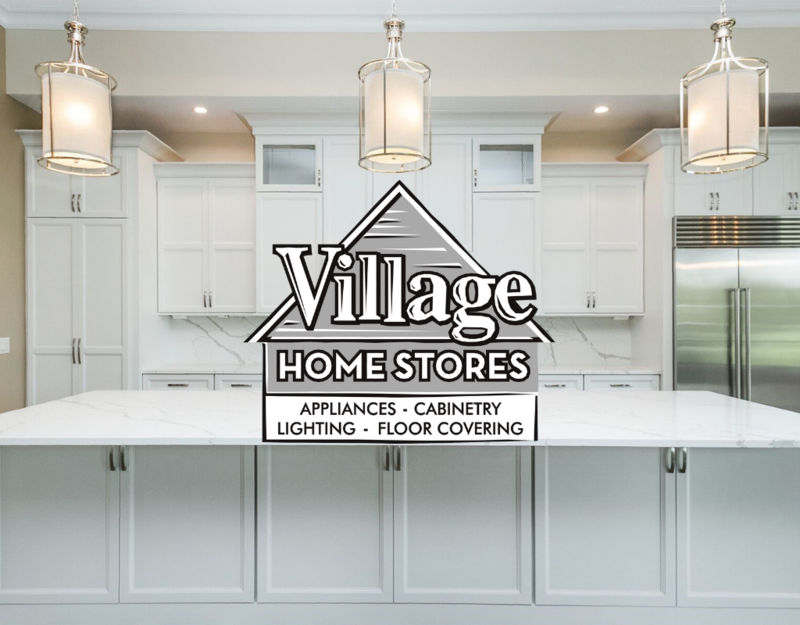 Our Low Price Guarantee plus bundle your purchases throughout our store from all of our departments and earn credit for FREE lighting in your new home. Call our New Construction team or your contractor to set up an appointment today to learn more. The master bath in this home turned out incredible! The same “Ridgegate” door from the kitchen has been painted in Koch’s “Taupe” paint. An “Ebony” accent glaze helps showcase the edges and details of the doors and drawers. 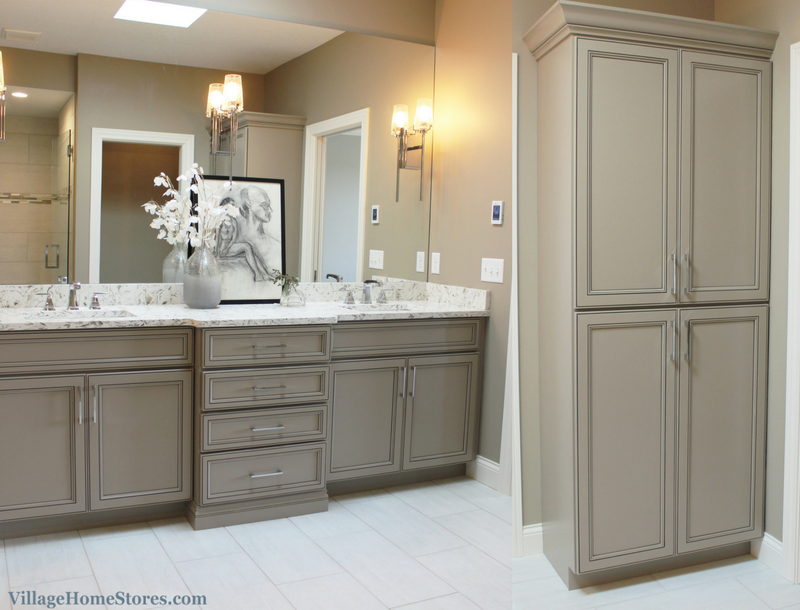 Vanity cabinetry and a tall linen cabinet have been installed for a beautiful look with wall-to-wall mirror above the sink area. 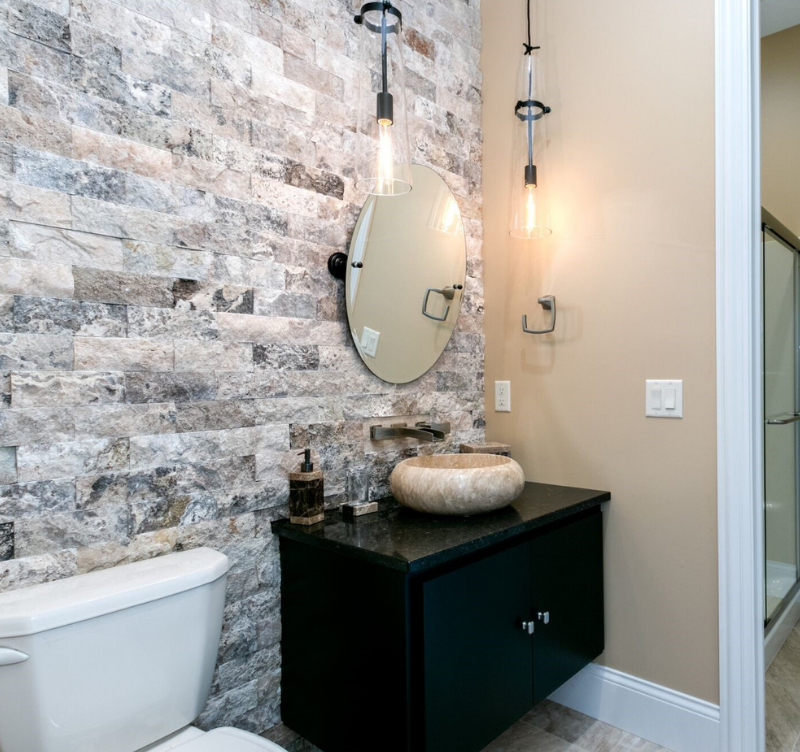 Sconces from our Kichler line are mounted directly through the mirror. 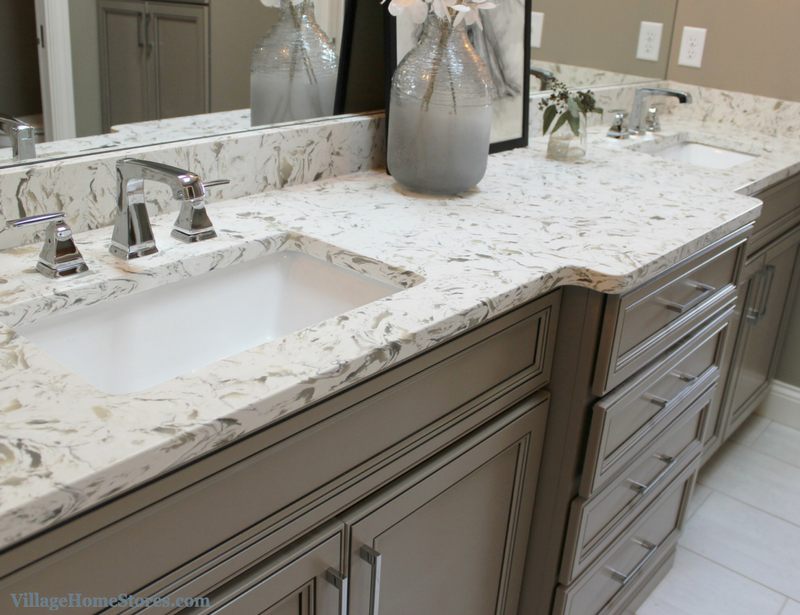 Quartz counters in the “Mont Clair White” design are a beautiful blend of the cabinetry and tile colors in the bathroom. This entire home was furnished and staged by Calla located in Davenport, IA. 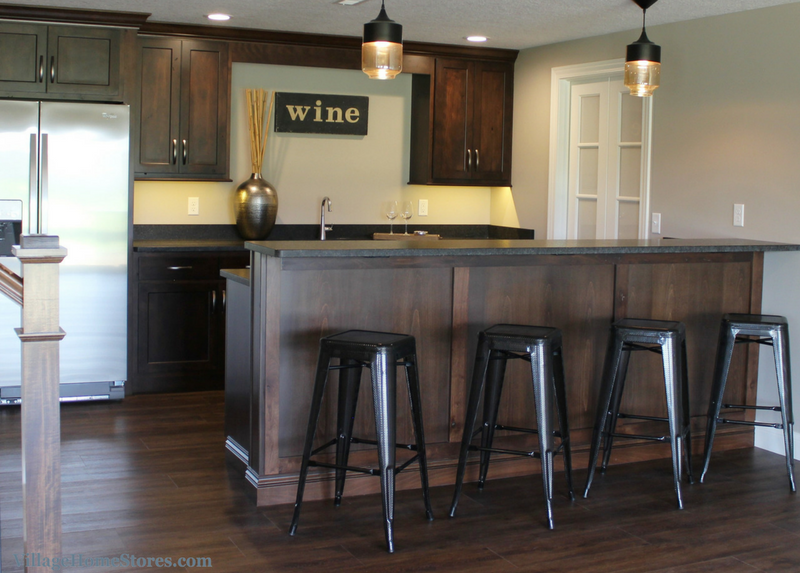 The lower level of this home includes a wet bar area also designed by Village. Koch’s “Vicksburg” door in a Rustic Beech wood and “Mocha” stain give a rich, warm look to the space. A back sink wall of cabinetry including a side-by-side refrigerator faces a two-level bar counter. 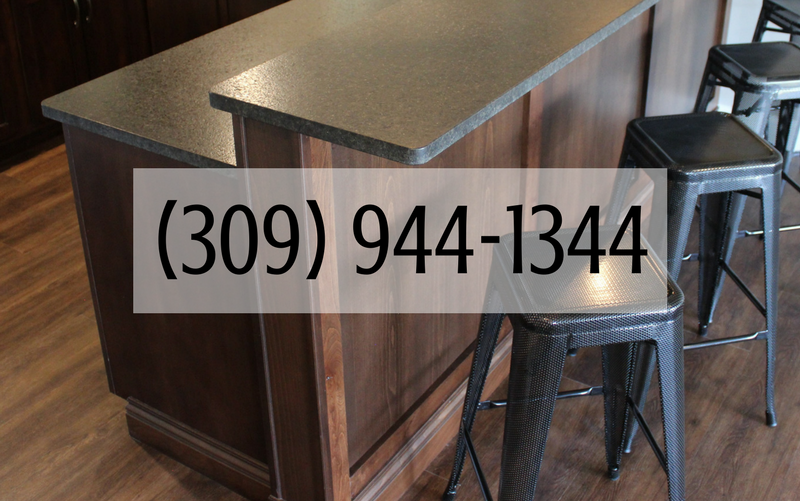 “Black Pearl” granite tops in the brushed finish give a leathered look to the bar area. See the full album of photos from this project over on our award-winning Houzz page here. There you will see the other lights, bathrooms, and more kitchen and bar images. Are you planing on building a new home soon? Perhaps considering remodeling the one that you are in? No matter what your project or budget is, we are excited to hear about it! Our award-winning team will help you determine your own personal style and create a complete design with you that reflects you and your tastes. Learn more about Heartland Builders here and be sure to reach out to us with any questions about what you have seen or read here.